On 13th February 2019, Maria Ressa, an award-winning journalist working for news platform Rappler was arrested by the National Bureau of Investigation (NBI) officers in connection with "cyber libel" charges. She was released on bail the following day. Ressa is currently serving as Rappler’s Chief Executive. The charges were filed by the Justice Department over a 2012 Rappler article, which was updated in 2014. The article linked a Filipino businessman to murder, human trafficking and drug smuggling. Rappler cited information contained in a 2002 intelligence report but did not say which agency compiled it. The businessman’s lawyer says the information was wrong and the article was defamatory. As such, the legal proceedings are a result of the client wanting to clear his name. Former Rappler researcher Reynaldo Santos Jr. has also been charged in the case. The NBI had previously closed its investigation on the case because it found no basis to proceed with the complaint, but recently reversed that decision to pursue the charge. Ressa told the Committee to Protect Journalists (CPJ) that the cyber libel charge was "political" and that "the law is being weaponised in an attempt to control the public narrative. We will not be intimidated and will continue to shine the light on actions of impunity." Rappler has been a vocal critic of the Duterte regime and especially its notorious ‘war on drugs’. In response, the Duterte administration has specifically targeted individual media outlets that criticise key policies, thus creating an increasingly hostile atmosphere for the country’s independent journalists and media outlets to operate. 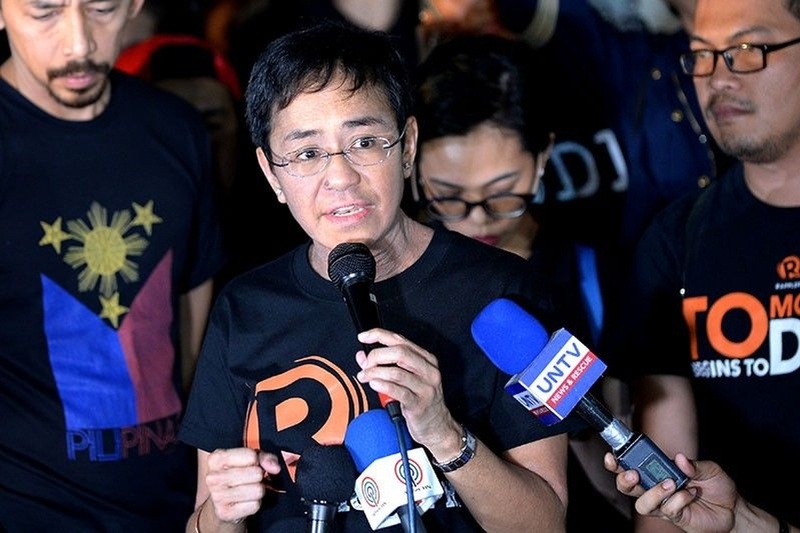 As previously documented, in November 2018, the authorities in the Philippines accused Rappler and its founder Maria Ressa of tax evasion and failure to file tax returns. Rappler has denied the accusation, saying in a statement that the legal threat was a 'clear form of continuing intimidation and harassment against us, and an attempt to silence journalists.' In December 2018, Maria Ressa, turned herself in and posted bail. Maria Ressa has received numerous prestigious awards such as the Free Media Pioneer Award, the Golden Pen of Freedom and the Knight International Journalism Award. On 22nd February 2019, human rights groups Human Rights Watch, Amnesty International and FORUM-ASIA called on the Philippine government to drop the politically-motivated charges against Senator Leila de Lima, two years after her detention. De Lima has been arbitrarily detained inside the headquarters of the Philippine National Police since 24th February 2017, in ‘violation of her constitutional rights as a sitting senator and in contravention of international human rights law’. De Lima was the first politician to be targeted by Duterte’s administration after he became president in June 2016. In August 2016, de Lima, as Chairperson of the Senate Committee on Justice and Human Rights, started an investigation into the killings that began immediately after Duterte took office. According to the human rights groups, Duterte and his allies in the executive and legislative branches responded with a year-long smear campaign against de Lima. Legislators blocked the committee’s investigation and instead used her alleged links to imprisoned drug offenders, which rest mainly on the testimonies of these convicted individuals, to justify her arrest and detention in February 2017. On 4th December 2018, the House Committee on Human Rights passed a landmark bill seeking to define the rights and fundamental freedoms of human rights defenders. The bill obliges and mandates government agencies to act within three days on all reports about possible human rights violations. According to Front Line Defenders, in their Global Analysis 2018 released in January 2019, the working environment in the country has been especially challenging for defenders of land, indigenous peoples' and environmental rights and at least 39 rights advocates were killed in the Philippines in 2018. In January 2019, more than six hundred people including Beverly Longid, Global Coordinator of International Indigenous Peoples Movement for Self-Determination and Liberation (IPMSDL) was removed from a government ‘terrorist-list’ in an amended petition submitted by the Department of Justice (DoJ) to the Manila Regional Trial Court. A government petition, filed in a Manila court in February 2018, accused 649 people including several indigenous people’s leaders, environmentalist, church workers and human rights defenders of terrorism and alleged membership of the Communist Party of the Philippines (CPP) and its armed wing, the New People’s Army (NPA). SAMASA UPV calls on all Iskolars ng Bayan to join the candle lighting and indignation protest to demand justice for the murder of a UPV alumnus, Randy Felix Malayao. Malayao was a former Editor-in-Chief of Mangingisda and an NDFP Peace Consultant. On 30th January 2019, Randy Felix Malayao, a human rights defender and peace consultant for the National Democratic Front of the Philippines (NDFP), was shot dead while he was asleep on bus in Aritao, Nueva Vizcaya. According to Frontline Defenders, at around 2.00 am, Randy Felix Malayao was shot twice by an unidentified gunman when the bus he was travelling home on made a stopover. The gunman reportedly boarded the bus while it was parked and left the scene motorcycle with another rider. Randy Felix Malayao was asleep at the time and was killed instantaneously. Randy Felix Malayao was a human rights defender and peace advocate. Since 2008, he had served as a consultant on political and constitutional reforms for the NDFP, a coalition of groups that has long been engaging in peace negotiations with the Philippine government. Other than his work with the NDFP, Randy Felix Malayao was also on the board of trustees of the human rights organisation, Samahan ng mga Ex-Detainees Laban sa Detensyon at Aresto (SELDA)-Northern Luzon, the current vice president of the Makabayan coalition, and an active campaigner against human rights violations committed by the military in Cagayan Valley. Following the death his work and character were smeared by a slew of unfounded allegations from the Philippine National Police (PNP). On the night of 28th November 2019, members of a solidarity mission in Davao del Norte, Mindanao were was attacked by members of a pro-government paramilitary group and subsequently arrested and detained by the police when the convoy was in rescuing indigenous Lumad children. The mission was rescuing the minors fleeing from a village that has been targeted with military operations. Former politician, Satur Ocampo was arrested in addition to 74 activists whom are mainly members of a human rights group called Alliance of Concerned Teachers (ACT). According to local news reports, those arrested were charged with child trafficking and kidnapping on the basis that they were allegedly transporting 12 children from Sitio Lgang to Maco, Compostela Valley without the parents’ consent. According to FORUM-ASIA the mission was coordinated with local civil society organisations, Alliance of Concerned Teachers (ACT) and Education International (EI). Education International released a statement strongly condemning the illegal arrest and detention of the activists on trumped up charges. The Secretary General of ACT stated that this case was illustrative on how human rights defenders are criminalised and fundamental rights are violated in a country under martial law. Approximately 500 tribal people, farmers, and human rights activists from the southern Philippines organised a protest march to the military headquarters in Manila on 4th December 2018. The activists said they were protesting against the 'continuing repression of people's rights in Mindanao.' They were also calling for the termination of martial law in Mindanao because it has resulted in 'state fascism and tyranny'. President Rodrigo Duterte declared martial law across Mindanao on 23rd May 2018 after the so-called Islamic State gunmen seized the city of Marawi. The resulting five-month conflict resulted in the displacement of around half a million people, about 70,000 of whom remain in temporary shelters. The Philippine Congress has twice extended martial law in the region, which remained in place until 31 December 2018. Despite the protests on 12th December 2018, Congress approved the request of President Rodrigo Duterte to extend martial law in Mindanao for another year, or until the end of 2019. On 19th February, the Supreme Court, voted to uphold the constitutionality of the third extension of martial law in Mindanao and to dismiss 4 petitions that questioned the third extension. On 29th November 2018, three police officers, Arnel Oares, Jeremias Pereda and Jerwin Cruz, were found guilty and sentenced to 40 years in prison without parole for the murder of the teenager Kian Delos Santos during an operation in Caloocan, Manila on August 2017. Dozens of citizens gathered outside the police station in Manila where the three were assigned to protest against the extrajudicial killings in President Duterte's deadly ‘war on drugs’. Duterte’s war has left 12,000 people dead, as killings were carried out by police officials and vigilantes. The gathering also was to remember Kian and welcome the verdict. Human Rights Watch in its annual report released in January 2019 reported that Duterte administration’s “war on drugs” continued in 2018 and expanded into areas outside the capital, Metro Manila, including to the provinces of Bulacan, Laguna, Cavite, and the cities of Cebu and General Santos.